Not being one of the most known holiday targets, Wales is a gem of nature and attractions in fact. For me it's qualities seem strongly underestimated. It is an area of natural beauties at it's best - wonderful coastlines between sandy beaches, wild and rocky stretches, a bunch of national parks or an amazing costal path inviting for extended walks. Or make a day trip to Skomer Island when looking for birds or just beautiful landscapes. The single track roads in the outer areas are as small as the hearts of the Welsh people are gigantic - we experienced warm welcomes and friendly talks whereever we came. One of the easiest ways to meet people are the pubs. It's not entirely about drinking (although my hearts beats for Ales now), you should really try the bar food (together with a nice Ale though). Talking about food - enjoy a full English breakfast (partially you may find a Welsh breakfast as well). Doing this as a vacation-typical morning time around 11:00 am, you won't need anything else before late afternoon (which then is the right time for some Ales and pub food again). Friends of ancient walls will find their share. Examples are Manorbier Castle or Saint Davids Cathedral & Bishops Palace. You can also expect modern city life such as in Cardiff. Or touristic strongholds like Tenby. Whatever your preferences are - a calm and relaxing time off business in your own cottage, long nature walks or fun and cosiness - it's your choice. Dylan Thomas was a child of Wales, born in Swansea, and - besides other locations world-wide - spent quite some part of his creative period back in Wales in Laugharne in a small boat house, about 32 miles from the location we spent two weeks in a cozy cottage in August 2016. Having experienced and sensed the nature, comfortable small stone cottages, widely green landscapes, hills and mountains and rough seascapes it became more perceptable to me, how this environment can boost creativity, which resulted in that high amount of works Dylan Thomas has created. Maybe by it's refreshing and simultaneously calming and recreating forces one needs to cut down on stress and distraction to find the necessary level of tranquility for creativity. Wales seems underestimated by foreigners as a great area for vacation. Compared to other locations we have seen only few foreign cars mixed in between the British ones, fewer foreign voices heard in towns, pubs and shops. A situation I can in fact savour while being a foreigner myself. But this was just another positive experience all over Wales: You did never feel as an alien, people are always and extraordinarily (and without exception honestly) friendly and cooperative. "“Wales: The land of my fathers. My fathers can have it!”"
I would take it, too. This map shows some of our stations and places of interest during our 2016 visit. Most of the time we stayed in a cozy stone cottage being part of an old farm at the hills above Littlehaven - a small fisher's town. From our cottage we had a great view into the valley down to the sea. Peace and outlook at it's best. 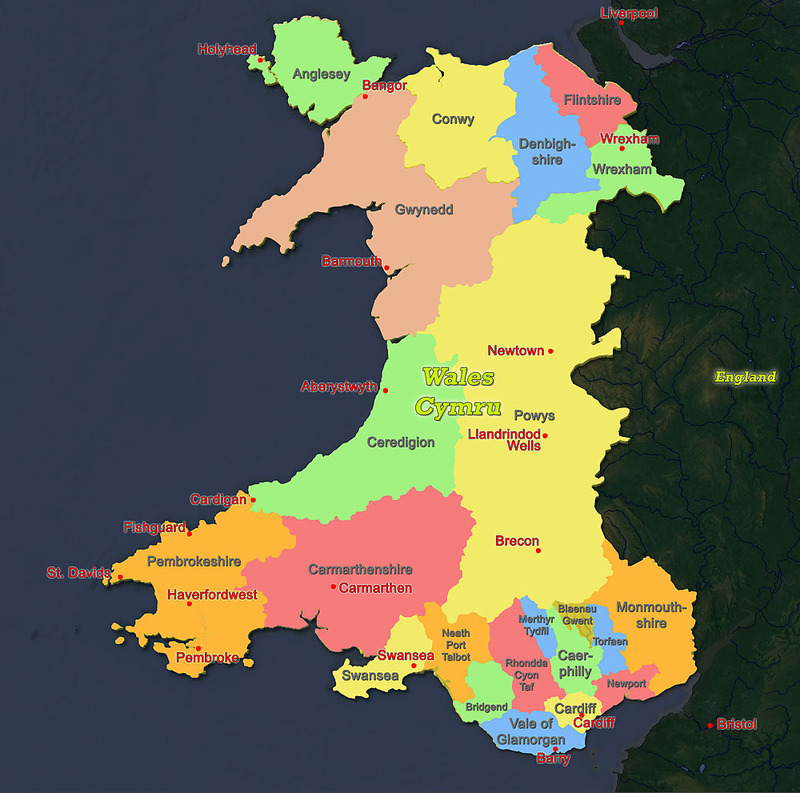 On the right the principal areas of Wales are shown. 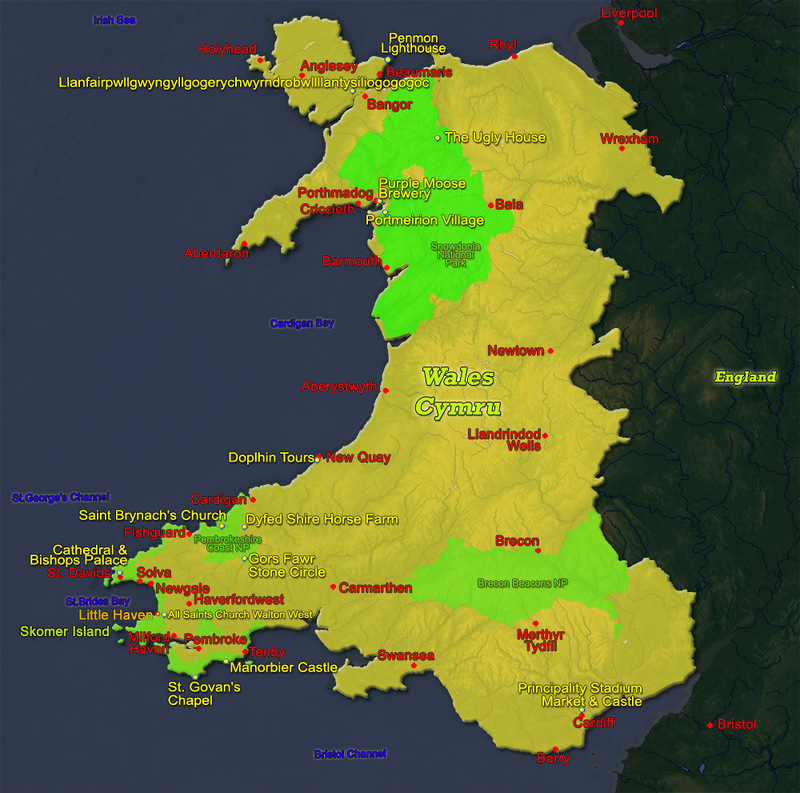 Our major region was Pembrokeshire, a few days in a hotel enables an extension of our sphere.